The majority of the styles you see on this page are currently in stock and ready to ship out. Lead time will be minimal if the bow needs to be made. However, colors and ribbon styles are subject to change depending on the availability of materials. Bows are also available for custom order; if you would like a particular style of bow please contact Rena@mightymitedoggear.com. Please allow additional time for manufacture for all custom orders. You can refer to the bows on this page for ribbon style, bead/stone, and sizing preferences. 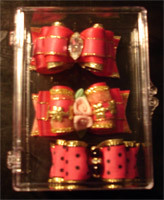 Free plastic bow case with your order of your first bow and every fourth bow! We will include a plastic case with your order, yours to keep. Use it to store your bows and to take them with you to shows!